The Kickstarter for Planetary Annihilation , the real-time strategy game about annihilating planets, may not have received quite the same level of attention as the Double Fine Adventure or Project Eternity , but it was nonetheless a huge success, drawing more than $2.2 million on a goal of $900,000. And now, just shy of two years after the campaign wrapped up, we have a launch date and a very cool new trailer. The description on Steam pretty much says it all: "Blow up everything, anywhere; dominate with punishing spacecraft, robots, and other futuristic machines of war. Arm asteroids and send them on planet-destroying collision courses. And take over an entire galaxy in a dynamic single-player mode with procedurally generated content. Don't just win, annihilate!" In case there was any doubt, behold today's launch trailer, in which armies of automatons do just that. It's not big on plot, but man, there are a lot of explosions, and the narrator's building excitement as the destruction reaches a fever pitch is hilariously over-the-top. It's like pillow talk for Darth Vader. 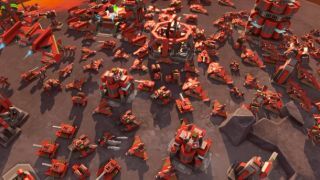 Planetary Annihilation is available now as an Early Access game on Steam, but will launch officially on September 5. For a closer look at what's in store, feel free to read our preview of the Galactic War single-player mode from May.